After being inspired by Kim's board over at Desire to Inspire this weekend, I decided to make one for myself! ! It was pretty EASY so I thought I'd share how it was done...First find a frame that you like, and embellish or paint. A good place for frames are antique stores or even Michael’s craft stores. I got this wooden one on Ebay for about $55. Next, buy a 2’x4’ hardboard from a home improvement store (this one was $3.22 from Home Depot). 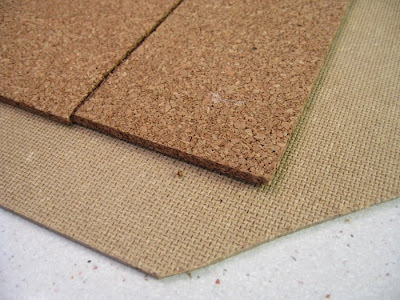 Hardboard is a composite that has one very smooth side and one rough side & is what pegboard is made from. Cut the hardboard to about 1/2” from the edges of the frame. Use a good box cutter and a meta straight edge to do this. My guy helped with this part. You might have to first score it and then cut harder to get through the board. Lay the hardboard smooth side down & place the frame on it. Arrange the cork tiles on top of it & cut them to fit. Leave as few gaps as possible and offset the tiles so that you don’t get a long seam anywhere. Make sure that the cork slides under the rim of the frame. Using a clear craft glue (this one I used Beacon’s 3-in-1 Advanced Craft Glue which works well on cork) affix the cork to the rough side of the hardboard. Use the glue liberally so the cork doesn’t slide later on. Let it dry for 10 minutes. 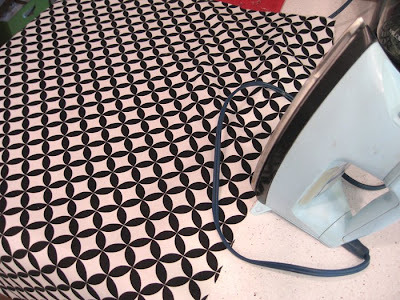 Iron the fabric you want (use finishing spray for a crisp iron) to use and then lay it out over the cork making sure it reaches at least 1” past the edge of the cork, even all the way to the edge of the hardboard. Fold down half of the fabric. 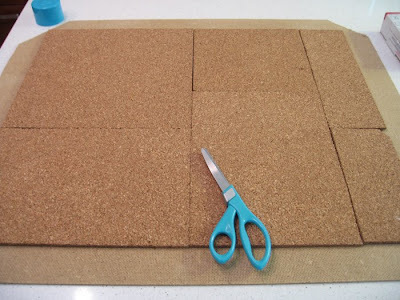 Run a heavy bead of glue along the edge of the corkboard then all over the interior. You should criss-cross the threads but don’t glob it too much – the fabric needs to adhere but not have solid spots. Unroll the fabric onto the glued section carefully, make sure any pattern is aligned properly, then smooth out the fabric over the glued cork. Don’t stretch it too hard, just smooth it. 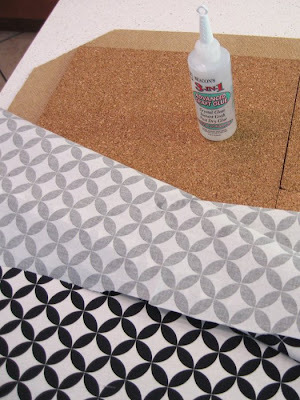 Repeat the step for the bottom half with a small amount of overlap. Do the last bit of smoothing and let dry for 10 minutes. Lay the frame front down on a hard surface covered with a towel or something that will not cause it damage. Place the hardboard piece on top of the back of the frame, fabric facing down, and align it (note in the photo that I wrote TOP so that I knew which side matched which). Using 5/8” or 3/4” wire brads, nail the edges of the hardboard down to the frame, about once every 3-4”. Using the box cutter, trim off any excess fabric. To mount it: you want it to be flush to the wall. Locate the studs nearest to where you want to mount it and mark 4 points on the frame where it can be nailed through, near the thinnest part of the frame. You’ll need at least 2 on top and 2 on the bottom for best results. Drill a tiny hole through the frame at all 4 points and using 2” finishing nails (or larger), mount it to the wall making sure you hit the stud. 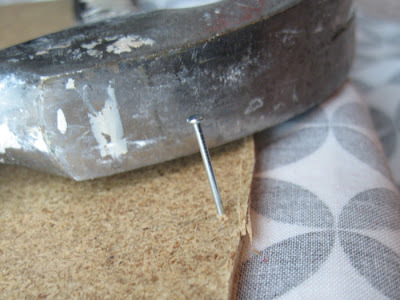 Use another nail to push the finishing nail into the frame slightly. 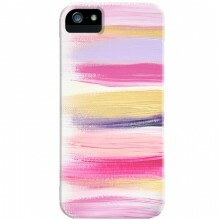 Cover the top with wood putty and apply a small amount of paint to cover it (or in a pinch, use White Out like I did). And there you go- an easy and pretty framed cork board that cost less than $40 for all the materials! *By the way, this is what my workspace wall looked like before. I love this idea! I am going to be on the lookout for a pretty frame now. What a fantastic idea. I must try it! Thanks so much for the tutorial. Gretel. i have 3 or 4 frames I did this to down in my studio. LOVE how easy it is and finished out looking! Great job. I hav eteh chicken wire as mine and sprayed it hot pink against a kelly green wall...similar in size to your space-thinking about stealing your printer idea to free up space(under my desk-where it is now)! cheers. how fun! I want to do it! I did a post on these last week. I found one at homegoods. painted it black to match my office and bammmm all good. I love it. its full now..doesnt take much to inspire, thank God. wow the result looks fantastic, maybe i should give a go too? :) thanks for sharing! I am having a small giveaway on my blog... if you have any time peek in and see if you want to enter! 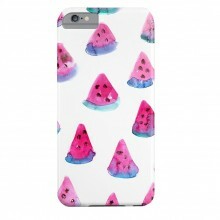 Super cute, I'm going to make one too!!!!! I love getting great idea from this and other fabulous blogs!!!!! I love it! It's so pretty, I'll do it! just letting you know ugly fashion finds are posted. I am working on my space right now. thanks for the inspirations. I attempted one of these several years ago but I didn't use all the correct supplies! Thanks for the instructions, I can't wait to try this!! This turned out so well, and that fabric choice is beautiful. Love it. This is so cool, I have to make one of these. Thanks for the inspiration. Looks great! 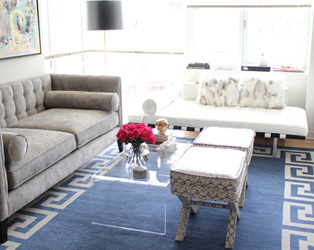 Your home always looks perfect and chic! I want to live there! Just beautiful! I love the way it looks in the office. Plus I love the pop of your wall color. Fantastic! I love your high-style, budget-friendly ideas. it turned out beautiful! 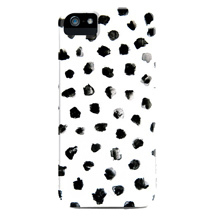 LOVE it and want one of my own! oh, love it! You make it look so easy. That fabric is so lovely. Question: in the center of your inspiration board, you have a cut-out of the word LOVE. That should be on the front of a card! I love it!!! love your inspiration board. i just recently bought one myself, but it's the plain o' black frame cork board ...i'm in search for a nice frame now to make it a little more glam :). Hi Jennifer, great idea and you have got the right style for it.. Thanks for the comment. I can't wait to get the prints I ordered off your site. I have been in love with them for quite some time. I love your work and I am always referring friends. Keep it up. You're awesome! And I love that you knew when my order was shipping. You're on the ball. Oh how lovely! I want to make one now. Thanks for sharing! What a lovely idea ,and it turned out fabulous ! Love it. It's beautiful Jennifer. I love this board and have a similar one at work! FABULOUS! 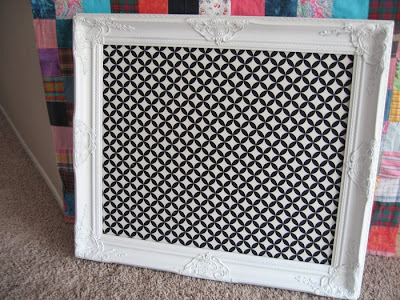 I love the glossy white of the frame, and the fabric you chose is so spunky. What a great DIY! This is a great project, thanks for sharing! I really enjoy your blog, and decided to feature your new butterfly print. Stop by at Sparkling Ink to check it out sometime! I love it, Jennifer! A job very well done. 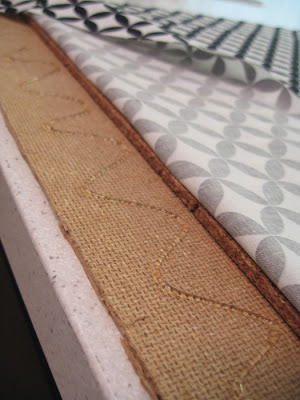 I came across Bruch At Saks blog and she posted about this inspiration board made from a coffee sak, check it out. Such a neat idea, I will definitely send you photos of mine when I get around to doing it. (And I am obsessed with your desk chair. It's gorgeous). This turned out great! Love the fabric you chose! I'm working on some inspiration boards this week - this is inspiring me! Oooh...I love this! Now I want to add a frame to my inspiration board. How pretty! Chair pairs well, it looks fabulous, I haven not done a hard inspiration board yet, I keep everything still in the PC = ) but it looks fab. Hi! Loved this post. I have used the same fabric for recovering my old chairs and I love them now! Anyway, it's by Alexander Henry and called "Diamond Eye" I also purchased it at JoAnns fabric in the black/white fabric section. Hope that helps! WOW, it's beautiful. I made one over the summer, and I think it would actually be complete had I seen your directions! LOVE IT!!! this is beautiful. :) i have a frame that is painted adn just sitting waiting to become as beautiful as yours! i love to come here...it's always so bright and cheery! This would be a good project for me to do after I move. Thank you for posting these detailed instructions. I loved and try to make it! This is a very helpful entry. Thanks! Your inspiration board and office are gorgeous. I'm featuring a photo of the board with a link back to your blog for my latest entry on inspirational boards and glamourous home office spaces. Thank you so much for your inspiration! Today I got all the materials and tomorrow I will be out there making my first inspiration board! 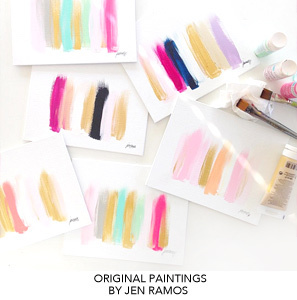 It will be an inspiration board inspired by Jen! LOVE THIS! I need one for my craft room & the ones on etsy are just too expensive. I've been looking everywhere for the perfect frame and I love the one you got...would you mind sharing which ebay seller you purchased yours from? Thanks so much for the DIY instructions! I'm not sure if you even still have this in your new place, but I came across it in a google search and love it. Thanks for sharing! I just wanted to let you know that I included a photo in a post I wrote. Hope you don't mind. God bless!